Thank you to Christine Johnson (nee Bartholomew) who has added her memories to the photograph of the Booth and Fisher bus taken in 1957. It was easy for me to identify where the bus is waiting because this is where I used to catch a bus every school day from 1959 -1966. The bus is at Highmoor top. 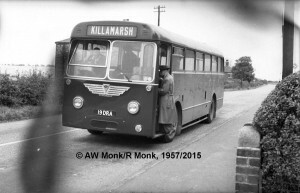 It is on the Killamarsh to Sheffield route and Highmoor was the terminus for Killamarsh. The bus would have just reversed into Hut Lane and is now facing back to Killamarsh on its return journey to Sheffield. In those days the fares were still collected by the bus conductors and conductresses and it was also their job to turn a handle to alter the destination panel above the windscreen, which is obviously still waiting to be done on this photo as it should now read Sheffield. Some names I remember in their role as conductress are Cora Perkins, Mrs. Louder and Maisie Fox. Other names elude me although I remember Eric Burton as a driver and in later years I was privileged to be shown his many photos of different types of Booth and Fisher buses in his album, of which he was very proud. On this photograph in the distance is Pebley Lane. To the left of the bus, just visible, is the side of the first house in a row of four, still standing and facing down Hut Lane. 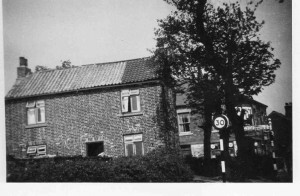 Today there are semi detached houses to the left of these which I remember being built after this photograph was taken. The semi detached houses on the corner of Hut Lane had not been built at this stage. There was a house once owned by my great grandad and used as a shop and by the side a large stone wall, which we used to “hug” while waiting in the snow and rain for the bus. My friends who also caught the school bus were Kathryn Weston (now Jackson) and Philip Illsley. To begin with we caught a much smaller and older Booth and Fisher bus to Westfield Lower School at Halfway. This was for the first three years after which we graduated to the service bus, (possibly the one in the photo), and had to change in Killamarsh to catch the Sheffield Corporation bus to Westfield Upper School at Mosborough. Along the way the bus picked up pupils from Norwood and in Killamarsh pupils who had walked from the Manor Estate and who could look forward to the homeward trek later in the day with satchels heavy with homework up Bridge Street, High Street and Upperthorpe Road, uphill all the way! cora perkins used to live in one of the 4 houses facing down hut lane. mick weston.